Free info. Miniature Schnauzer, Standard & Giant Schnauzer. Ever Wondered What A Schnauzer Thinks? Welcome & congratulations to you all, first for spelling schnauzer correctly & second for being interested in such an intelligent, loyal, affectionate and handsome dog! If you're already an owner, you're thinking of getting one or you're just a good old dog lover, then you've arrived at the right place for professionally researched and written factual advice. you'll find free info about these wonderful pets and a place to share pictures and stories with other schnauzer lovers. We also help to give dozens of Schnauzers a new lease of life. If you are looking to rescue or find a new home for a Schnauzer, click on Schnauzer Rescue for details. PEPSI and MAX in Kent, brother and sister Mini Schnauzers NEED A NEW HOME TOGETHER, February 2019, can you help? Contact Tina for details. 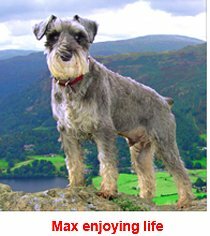 This website, set up in 2008, is a tribute to Max, our wonderful and unique Mini Schnauzer who came into our lives in 2005 - and once you have a Schnauzer, life is never quite the same! Max passed away in early 2018 after 13 very full, happy and eventful years. He brought so much joy and love to our lives that we wanted to share our passion for these unique dogs. As a professional author and photographer, I've researched & written many of the articles and the rest have been provided by experts in their field. We tell it like it is - good and bad. Our site isn't just about Miniatures but also their big cousins the Giant and the Standard. It's the only international website for all three types. 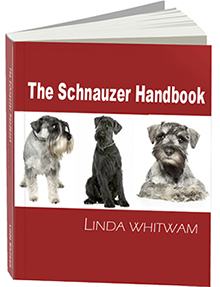 The Schnauzer Handbook, available from Amazon as a 251-page printed book or Kindle, tells you everything you need to know about choosing a Schnauzer puppy and then looking after him or her from a few weeks old right through to old age. We've got some great pages where you can send us your photographs or tell us your favourite story and we will publish them on the website. If you've got a question, send it to us at FAQs and we'll do our best to help. Visit our rescue pages if you are looking to rescue a Schnauzer or have one that needs rehoming. To keep up-to-date with the latest news and contributions, click on the orange RSS button on the left and we'll automatically send it to you. You'll discover how to spot a good breeder, what to look for in a puppy, how to care for seniors (dogs, not relatives! ), obedience training, how these dogs help pet allergy sufferers and a whole lot more. P.S. Want to really know what these intelligent dogs are are really thinking? Check out Dog's Life, written by Max, and read all about his wild day out on the moors and other great adventures! Miniature Schnauzer - the small dog with the big personality and universal appeal. Discover the real facts about this popular and hypoallergenic dog breed. The Giant Schnauzer - the Mohammed Ali of the dog world. Are you ready for the challenge? The White Schnauzer is becoming increasingly popular, but still causes controversy. You either love 'em or hate 'em - find out why. The Schnoodle - a Schnauzer Poodle cross. Are they really non shedding and hypoallergenic? Read the truth about the Schnoodle here. Are non shedding and hypoallergenic dogs the miracle answer for pet allergy sufferers? Find out here. Schnauzer Pictures - see our gallery of Giant, Standard and Miniature Schnauzer photos - and add yours too. Schnauzer breeders come in all shapes and sizes. How can you tell the good from the bad? Find out how you can pick the right breeder with well-bred, healthy puppies. Visit our Schnauzermania Store! Find a super schnauzer-related gift or pet product at the click of a button. Great discounts! Takes the legwork out of shopping for something special.